The Best Karate Youtube Channels from thousands of top Karate Youtube Channels in our index using search and social metrics. Data will be refreshed once a week. About Youtuber Official YouTube channel of the World Karate Federation (WKF), offering the best karate action from the WKF World Karate Championships, WKF European Karate Championships and the World Combat Games.Subscribe to the WKF channel to never miss out on the latest karate action! About Youtuber My name is Jesse Enkamp and my mission is to unite the Karate world by helping people master themselves through Karate, bridging the gap between the old and the new – without stylistic limitations, political agenda or dojo dogma. About Youtuber We upload training videos, karate lessons, self-defense instructionals, vlogs whenever we travel and anything else we feel will benefit you on your path in the martial arts. Subscribe to get updates and new training ideas! About Youtuber Instructional videos on practical karate and kata application from Iain Abernethy. About Youtuber West Wind Dojo is the Florida representative of the Nihon Shotokan Karate-do Federation. Our dojo is the functional arm of the Traditional Martial Arts of Sarasota Inc. - a non-profit organization designed to perpetuate the study of Karate as a cultural experience. The physical nature of Karate-do is the method or vehicle to achieve self-awareness, discipline and strength of character. About Youtuber We are two German based karateka and best friends. We like to share our knowledge and experience for everyone. About Youtuber Find videos and tutorials on karate. About Youtuber We post videos relating to Okinawa Goju-Ryu Karate and related training methods. About Youtuber Shuhari Institute is a non-profit organization promoting Traditional Karate to its individual & dojo members with an inclusive and open organizational model. Based on the developmental stages concept of Shu, Ha, and Ri, the Institute’s mission is to advance Traditional Karate by promoting technical excellence, encourage individual innovation, and support creative mastery. About Youtuber Welcome to the T.O. Westlake Karate Studio Youtube Channel... We specialize in family training, from pre-schoolers ages 3-5 years old, children 5-10 years old, teens and adults. We also offer women's self defense, grappling and self defense for seniors. About Youtuber I'm a full time instructor based in Dublin, Ireland and Chief Technical Director of Hombu Dojo Karate International. About Youtuber John Burke, chief instructor of the Eikoku Karate-do Keikokai demonstrates self defence moves from karate kata. Beginning his training in 1982, sensei was fortunate to meet a variety of great instructors who have helped him to generate a system that takes Karate back to its roots. About Youtuber A channel dedicated to everything related to karate. About Youtuber The goal of Bushido Karate Shotokan of Raleigh North Carolina is the physical, mental, and spiritual growth of its students. About Youtuber Oofficiel youtube channel of karate1 premier league ,offering the best karate action from the WKF World Karate Championships, WKF European Karate Championships and the World Combat Games. About Youtuber Everything Shotokan Karate. From beginner to black belt and beyond. Shotokan kihon, kata and kumite videos. About Youtuber I originally set up this channel to serve as a bit of a social experiment--to share videos of myself practicing karate and see what style people thought I practiced, and what rank they thought I was. It was a fun experiment, and it turned out that most people were either completely correct, or very close. About Youtuber Kaicho Hoosain Narker opened his dojo in 1980 and was certified by the founder of Ashihara Karate in March of 1985. Together with many of his students, he shares the dynamics of Ashihara Karate's Sabaki principles.The clips shown here include various training sessions, tournaments, events and activities both in South Africa and abroad. Under Kaicho's supervision, the AKI (Ashihara Karate International) has spread across the globe. About Youtuber This channel is created by Japanese female Karate-ka living in Melbourne, Australia. Natsuko currently holds 4th dan of Shotokan Karate International and she runs her Karate club in Richmond and South Yarra. About Youtuber The KUGB was established in 1966 for the development of Shotokan Karate, and is the largest and most successful single-style association in Great Britain. About Youtuber Traditional Goju Ryu Karate club based in Essex, UK. The videos here are from various training sessions, seminars, events and tournaments that we have been involved with, both inside and outside of the Seitou Ryu Karate Club. Students are welcome to use these as a reference aid in their own training. About Youtuber The Amateur Athletic Union Karate channel has been set up to promote AAU athletes, clubs and events. We will post videos of AAU events, and videos with coaches and athletes wearing the AAU crest. About Youtuber Super Kicks Karate in Ashburn, VA, is Loudoun County's BEST CHOICE for after school karate classes, youth karate classes, after school programs, and adult karate classes. About Youtuber Traditional Shotokan dojos in South Africa. About Youtuber Malvern Shotokan Karate Club teaches traditional Shotokan Karate with classes in Huyton, Dovecot, Halewood, West Derby and Walton. About Youtuber Welcome to Ultimate Success Karatel where students come for Personal Growth, Inspiration and Amazing Workouts! We provide a training experience like no other...one that will shift your mindset so you can achieve greater success in your workout and in life. About Youtuber Located in the extreme NW corner of Ohio, Franz Karate is headed up by Steven Franz and Rokudan 6th Degree Black Belt and nine time hall of fame inductee. About Youtuber 3G Karate began as a summer small group program in 2011. It now functions as an independent karate school in Hillsboro, Ohio under the National Black Belt Karate Association Foundation open to all students ages 5 regardless of church or religious affiliation. About Youtuber The official Sunshine Coast Karate You Tube Channel. A variety of short videos to inspire and educate members, families and friends of Sunshine Coast Karate. About Youtuber These videos are to assist in the training of Lions Karate students. Please do not misuse these videos to self-train. It is very important to train under an instructor with experience in order to fine tune your techniques. Self-training is possible, but rarely done correctly. About Youtuber Welcome to The Karate Dojo Ripon, home of Byakko Shotokan Karate Association (BSKA) We offer progressive karate training, based on constant improvement and refinement, comparable to the best available training in the UK. The Karate Dojo - Ripon routinely holds courses with some of the world’s top instructors for the benefit of all its members. About Youtuber West Londons leading professional karate club. About Youtuber Channel about tactical karate. Focussed on a tactical application of karate's self defence principles as studied in Sekishin Karate Jutsu International. CONGRATULATIONS to every youtuber that has made this Top Karate Youtube Channels list! 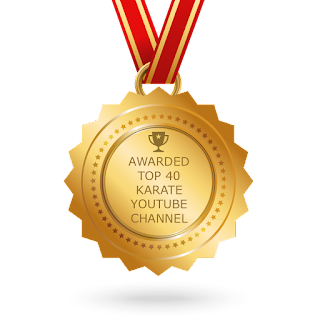 This is the most comprehensive list of best Karate Youtube Channels on the internet and I’m honoured to have you as part of this! I personally give you a high-five and want to thank you for your contribution to this world.